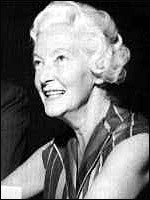 One of the most respected film critics, Dilys Powell reviewed the week's releases for the Sunday Times from 1939 to 1976, then went to the weekly journal Punch, as well as contributing to journals such as Sight and Sound. Unlike the other 'Sunday lady', C.A. Lejeune , she was open to new directions in cinema, and was not constrained by the middle-class shibboleths of 'good taste' and the literary and realist parameters of quality British cinema. She was refreshingly ready to find merit in American genre films, and without being merely trendy she never seemed out of touch. And of course she wrote with precision and elegance: she always made one feel what was there in the film, not just what she thought of it, and she never lost her passion for what film could do. She was also a regular radio panellist on My Word. She was awarded a CBE in 1974 and a BFI Fellowship in 1983. Christopher Cook (ed), The Dilys Powell Film Reader, 1991.